After a 14 year hiatus, the Parr family–better known by their superhero alter egos–return June 18 in “Incredibles 2,” the long awaited sequel to the 2004 hit Pixar Academy Award winner. A week before the movie’s wide release, the cast and creators of the film sat down in West Hollywood to talk about the expectations for the film, the renewed relevance of superhero films and the universal appeal of the films that draws audiences of all ages. 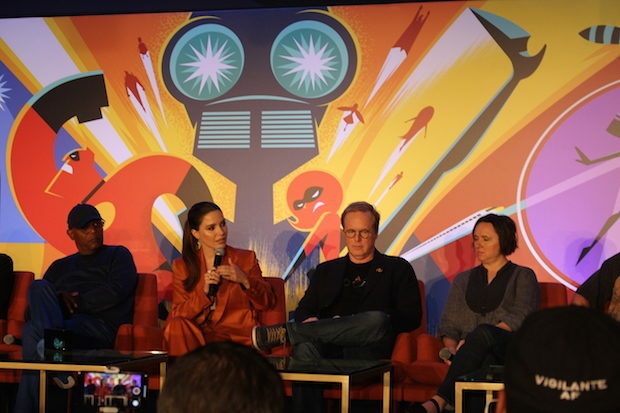 On the panel was director Brad Bird, producers Nicole Grindle and John Walker, Craig T. Nelson (Bob/Mr. 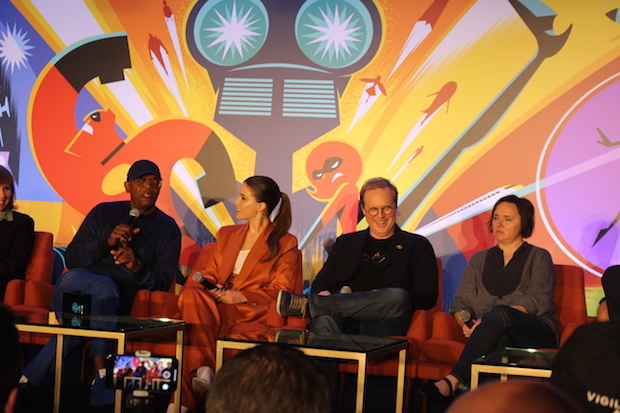 Incredible), Holly Hunter (Helen/Elastigirl), Sam L. Jackson (Lucius/Frozone), Sarah Vowell (Violet), Huck Milner (Dash), Sophia Bush (Voyd), Bob Odenkirk (Winston Deavor) and Catherine Keener (Evelyn Deavor). 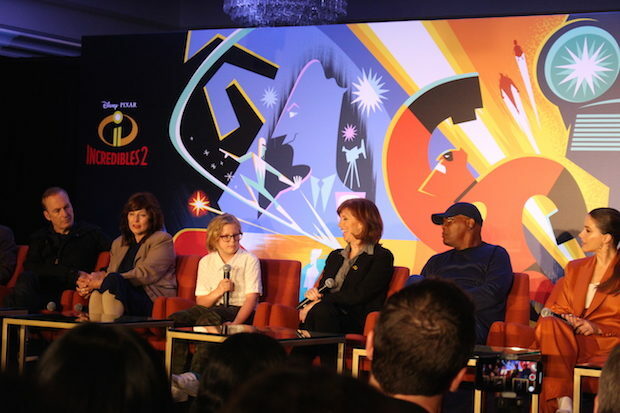 Brad Bird: [On the decision to pick up from the last scene in “The Incredibles”] I just thought it was kind of bold and weird because people take the time that passes very literally and they think that linearly the characters should have aged. But their age and their superpowers don’t reflect the part of life that they’re in and their role in the family. Nicole Grindle: Honestly, the technology has allowed us to make the film look more like what Brad intended it to look like the first time. The characters are much more finely nuanced and developed, we were able to build a lot more sets more quickly, we’ve populated the world with a lot more characters that have hair and clothing, and that’s stuff that most of y’all don’t notice, but actually it makes the world richer and more alive. Huck Milner talked about his first experience with “The Incredibles,” which was released before he was born. Huck Milner: I saw the first movie when I was like five because my dad show me it because he really loved the first one and I really loved it, too. My favorite character was Dash. And when I got the audition I was watching over and over again, and when my mom got sick of it, I used the audition as an excuse to watch it again. 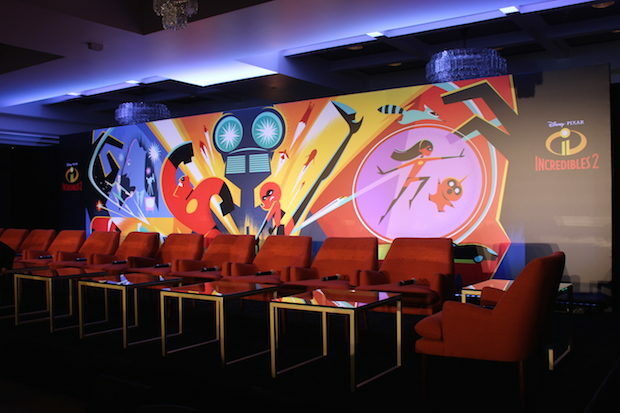 The panel also discussed how the film deals with a role reversal from “Incredibles” that sees Elastigirl becoming the face of heroes, while Mr. Incredible takes on the primary domestic role. Holly Hunter: It was a while before I truly realized what I was really going to get to do in the movie, and I was really thrilled…. It’s character revelation period, everyone is having character revelations including Jack Jack. Craig T. Nelson: I was resentful when I was told where Mr. 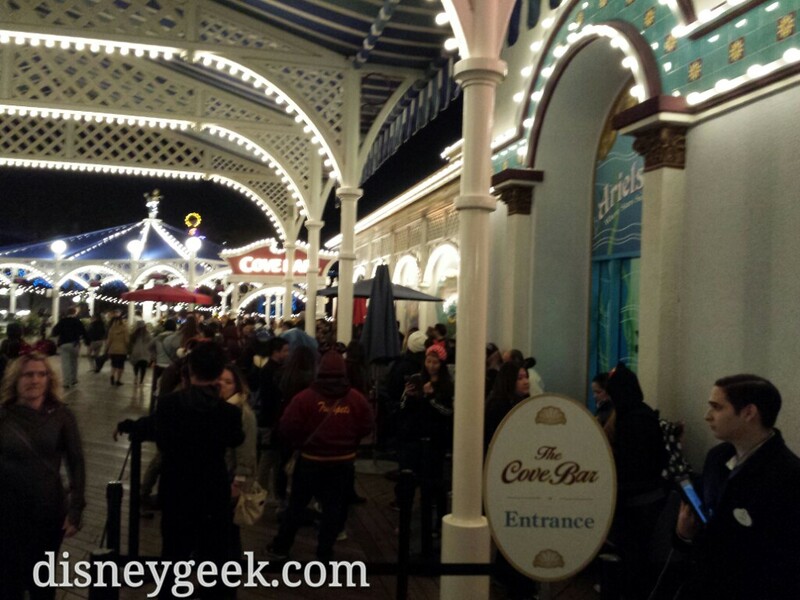 Incredible was supposed to be in this film…. And then I found out that I’m going to be helping to save the family: Bob’s going to learn how to be a dad, and he’s going to learn about these kids. And then the process started when we were recording, and it was just so much fun…. Having to deal with Elastigirl out there doing what I want to do, being able to give her the encouragement that everything’s okay at home…. I’m just so honored to be doing this film. Actors also discussed the challenges of working on an animated film that takes place in a world that is very realistic, while also being total fantasy. Sophia Bush: It’s totally nuts to go into the studio and I know that technically I’m talking to Holly, but she’s not there, and I’m just yelling into a void going “Am I doing this right?.” … And he knows what she’s done in the room, and he knows how are voices are going to sound together, so you just trust your captain and when he tells you you’ve gotten it right, that the tone is right or the volume or the size of your yelling, it’s very cool. Sarah Vowell: Not only do we not see a screenplay, sometimes we don’t know where we are in any scene, so like “Is this in a car? How loud am I?”. You’re trying to get a sense of the literal architecture of where the character is at because everything has to be drawn from scratch, whereas a live actor is actually in the car or a facsimile thereof. But where it is, that’s what the scene is about sometimes, it’s not just that they’re at a kitchen table, it’s everything that being a family a kitchen table implies. Finally, they discussed the universal appeal of the film, especially for viewers who enjoyed the first film and now get to take their children to the second. Holly Hunter: I think that we all felt that way about the first one as well, that it was a movie that stood on its own, that it’s not a kids movie. In a way, this one is particularly more not a kids movie, although kids totally dig it…. even small kids love Jack Jack and love Dash! In a way, the movie has complexity that is really astonishing and it has like five different movies and they all work in concert with each other, they all need each other, it’s an incredible fabric that has been woven together. It’s very sophisticated.